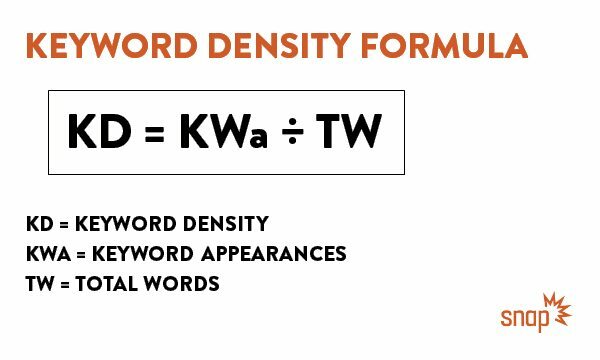 What’s the Best Keyword Density for Your Web Pages? SEO keyword use can be tricky if you’re a web marketer trying to achieve page one on Google. If you already know how to find trending keywords, you need to know how to utilize those phrases the right amount of times within your content. Keyword density in your blog posts, landing pages, service pages and other content is a strong indicator of relevance to search engines when they’re determining your overall rank, whether good or bad. Like a moth to a flame, your keywords attract the attention of search engine spiders, drawing them in until all they see are red hot rankings soaring high. It’s your job to build conversions by clearly communicating your ideas through your website — all you need is a little knowledge on how many times to use your key terms. So how many times should you use your keyword? Do you want even more of the best SEO keyword articles? If you’re in the industry, you can’t (and shouldn’t) live without these neat little nuggets of knowledge. Read our related posts on keyword optimization! Find necessary tools and easy tricks to identify the best trending keywords that will work for your content. Understand long-tail keywords and how to implement them into your online store’s content so you can sell more products. Get to know the best SEO page length so your blog keywords actually get high rankings! Understand the difference between informational, investigative, desirable and actionable keywords, and how they pertain to your online success. What’s the Best Keyword Amount? If you watch the video above, hiatus-prone SEO guru Matt Cutts explains in plain detail how many times you should use a keyword on a web page. As you can see, there’s no hard and fast answer. No percentage that will make the magic happen for your website—too high and you risk flagging a penalty, too low and you risk lacking relevancy. But that doesn’t mean there are some necessary guidelines and SEO best practices we need to enact in our web strategy. But first, let’s take a quick jaunt down history boulevard to ensure a bright SEO-success-filled future for ourselves. In the early days of the web, stuffing your site’s pages with certain keywords, much like a Thanksgiving turkey, was fairly common practice in the quest for page-one rankings. Let’s say you were Sega Genesis, makers of iconic video games in the mid to late ’90s, and you wanted to target the term, “best video games.” The idea was to use that target keyword over and over again in web content to show search engines just how relevant Sega was to video games and vice versa. Of course, fast forward 20 years, and we now know that this act of “keyword stuffing” is lost among SEO and content producers, and is known more for its harmful consequences instead of its useful ones. In short, don’t use what we in the industry refer to as “black-hat” keyword tactics. How Do Search Engines Understand Keyword Use? Similar to a phone book in style, but not in size, Google’s index is enormous. According to WorldWideWebSize.com, as of Wednesday, May 11, the web had at least 4.67 billion indexed pages. You can imagine why Google’s spiders only record page code and dump the pages they don’t think are useful, such as duplicates, those with low-word count or ones that are poorly laid-out—and especially keyword-stuffed gibberish. Your content needs to count. We’ll get into that in the next section. Internal and external link building is still the most effective way to increase your SEO rankings. Spiders work by hopping from link to link to uncover new web pages on the Internet. If your content is not linked to anything or from anything, it’s much more unlikely to be crawled and indexed. Link internally to relevant service pages and blog posts, and externally to useful resources or industry-leading articles. From the head of Google’s Web Spam team himself, saying that Google intentionally “hurts” pages that conduct keyword stuffing. So let’s ask ourselves, what is the Google search engine’s job, at its core, anyways? Larry Page, Google’s co-founder, once described the perfect search engine as something that “understands exactly what you mean and gives you back exactly what you want.” Since he said that, Google has grown to offer products beyond search, but the spirit of what he said remains. Its goal is to make it as easy as possible for you to find the information you need and get the things you need to do done. In the information-based aged that we live in, a search engine needs to be incredibly relevant, constantly analytical and unconventionally creative. So too does the modern SEO and content creator in order to manipulate the results in his favor. That’s why in digital we need to focus on the quality—not the quantity—of keyword use. Writing natural web copy centered around one or two key phrases (and variations of the phrases) is what will have search engines falling head over heels in love with your pages. Let’s say you want to target expecting mothers with your new stroller product. You create a landing page, identifying your target keyword, one with high search volume and low competition, as “strollers for infants.” Use that phrase, as Matt suggested, one to two times up front in your copy to inform the spider and human visitor alike what the content is about. Throughout the rest of your copy, mix it up a bit; try working keywords such as “infant strollers,” “strollers for baby girls (or boys),” “baby strollers,” “lightweight stroller”… you get the idea. Title tags should be between 65–70 characters. Use the main keyword at the beginning of your title tag and (try to) work in an additional variation of that keyword if possible. Ensure that you’re not repeating title tags as that may result in a duplicate penalty from Google. If you’re visiting a blog with multiple headlines, they’re probably ordered in this fashion on the backend: H1, H2, H3, H4, etc. These little snippets of code that are wrapped around your headlines give the spider (and human visitor) a high-level overview of your page. To give you an example, the first headline they’ll see when entering a landing page is “Cotton, White Socks, for $19.99!” You’ll have an intro paragraph, followed by your second headline, saying something along the lines of, “Why Come to Us for the Best Cotton Socks in Philadelphia?” followed by another explanatory paragraph, followed by a third and final headline that might say, “Contact Now for Top-notch White Socks in PA!” followed by a clear CTA. Humans can understand your page without diving deeply into the copy—that’s a great start in creating quality content. You can see how tossing in keywords and variations of such will help both humans and robots better grasp what’s most important on the page. Try to work a main keyword or variation into the H1 tag if possible. The URL is often an overlooked but nevertheless valuable spot to place your main keyword. After all, it is the fundamental route in which both spiders and humans navigate to a page. Including your keyword in your URL string can be paramount in achieving a top-tier ranking on the SERPs. Users find links with readable, descriptive terms more trustworthy, so there’s no reason not to name your URLs logically with organized keywords. Meta descriptions truncate at 160 characters, so it’s best to keep them below that amount. Anywhere between 150 and 160 is recommended. This is your best chance at creating compelling copy to draw a user into your website, so do not spam your meta description. Offering a natural and compelling introduction to the web page will help you draw visitors in, more so than stuffing it with keywords. Finally, you should have keywords in the content itself. One to two keywords up front, four to five if you’re writing long-form articles, and an appropriate amount of variations. But don’t add more for the sake of high rankings. Anything over those numbers won’t boost rankings much, if at all. When it comes down to it, relevance and quality are much more important than keyword density. Ensure that your pages’ keywords flow well with the text and don’t sacrifice quality for more keywords. If you’re dying to know the density of keywords on your web pages, we don’t blame you: There’s a lot of value in learning more about the content that makes up your website. You may be worried you’re stuffing or you may have old content that you wrote without any keyword knowledge. Whatever it may be, insert the necessary data in the formula below. A site like Word Counter might be useful, or look up word count within your document software. You’ll glean many insights from this practice. Good advice, Matt, good advice.